Two major things are supremely necessary for me to love a hand cream or lotion: 1. It must smell good because nobody wants stinky hands no matter how amazing the hand cream is, and 2. it needs to work because who has time to waste moisturizing if the results aren't good? When I went to London Grace for a manicure, one of the things I got most excited about was the hand lotion the manicurist used on my hands. It smelled incredible and felt like a silken veil being massaged into my skin. The consistency is rich without being thick or overpowering like some hand lotions. It smells sweetly of coconut (an aroma I've always loved), but the scent is subtle enough that it won't interfere with your fragrance. I love the non-greasy formula which moisturizes beautifully without leaving my hands feeling slippery or greasy. 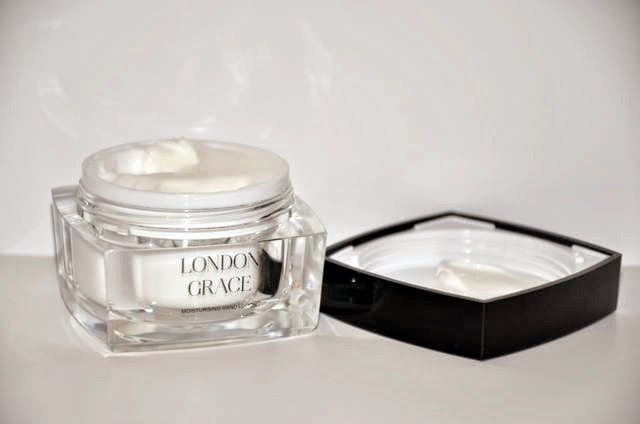 In short, London Grace Moisturising Hand Lotion is one of my new favorite products! Sleekly packaged in a chic glass jar with a glossy black lid, this fab product is small enough to keep in your handbag, but also looks beautiful on a vanity, bathroom sink or bedside table. Personally, I love keeping mine on my desk for giving my hands a little drink between projects. London Grace Moisturising Hand Lotion is a bargain at just £9 and available at London Grace on Putney High Street.